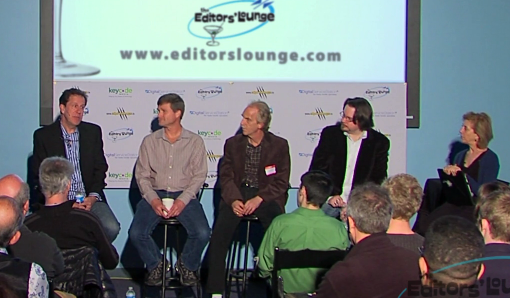 If you’re not going to make it to Vegas this year and are looking for a bit of pre-show analysis, check out the Editors Lounge Pre-NAB Panel Discussion Video. It features Terry Curren, Michael Kammes, Mark Raudonis, and I talking about such things as how the growing move to tablet devices and internet distribution is changing life for content creators. But we get into the gear, too, with a discussion about FCP-X, Premiere, Media Composer, Lightworks, and, yes, even the resurgence of the typewriter. Masterfully moderated by Deborah Kaufman, it makes for interesting viewing (and looks crystal clear at full res). This entry was posted on April 15, 2012 at 8:53 am and is filed under Avid, Avid vs. Final Cut, Media and Society, Quality of Life. You can subscribe via RSS 2.0 feed to this post's comments. You can comment below, or link to this permanent URL from your own site.